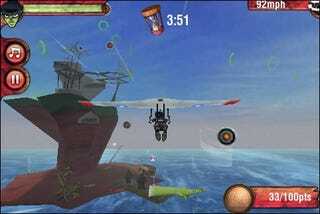 Pilot Murdoc's Doom Glider over the skies of Plastic Beach HQ in Escape to Plastic Beach, the virtual band's very own iPhone and iPad video game. The art of Gorillaz creator Jamie Hewlett comes to life in Escape to Plastic Beach, a combination video game and marketing tool for the band's latest album, Plastic Beach. Music from the album plays as Murdoc soars over the Plastic Beach headquarters, fighting ghost pirate ships and dogging obstacles while trying to keep 2D from escaping. The game features eight levels of action, voiceovers from the band, and leaderboards for those with the urge to be the best Gorillaz fan they can possibly be. I'll probably just stick with listening to the album, but if you'd like to give Murdoc a spin, the game is available now for the iPad, iPhone, and iPod Touch for $1.99 in the iTunes App Store.